Hot wassail and Christmas spirit were a’plenty during the second annual Wassail Festival in Blissfield last Friday, Dec. 15. Eleven businesses brewed up batches of hot wassail for the tasting pleasure of approximately 400 wassailers on the evening. The event was hosted by Blissfield DDA/Main Street Program and sponsored by Blissfield Rotary. Wassail is a hot or mulled cider beverage that originated in the south and west regions of England in the middle ages. Blissfield businesses were encouraged to create their own custom formula for the holiday beverage. Dan and Ashley Bailey of Bailey’s Chiropractic said they conducted some online recipe research for their wassail, which consisted of pineapple and orange juice, red wine, apple cider and various spices. “We wanted to mix it up, and used a completely different recipe from last year,” Ashley said. The winning recipe was voted on by the wassail-goers, and the top-ranking recipe went to B-Town Bar and Grill, followed by Cakes n’ Shakes in second place. Copyright 2012, River Raisin Publications, Inc. For the complete story on the Wassail Festival, please see the Dec. 19, 2012, edition of The Advance. More photos can be found on our Photo Galleries. 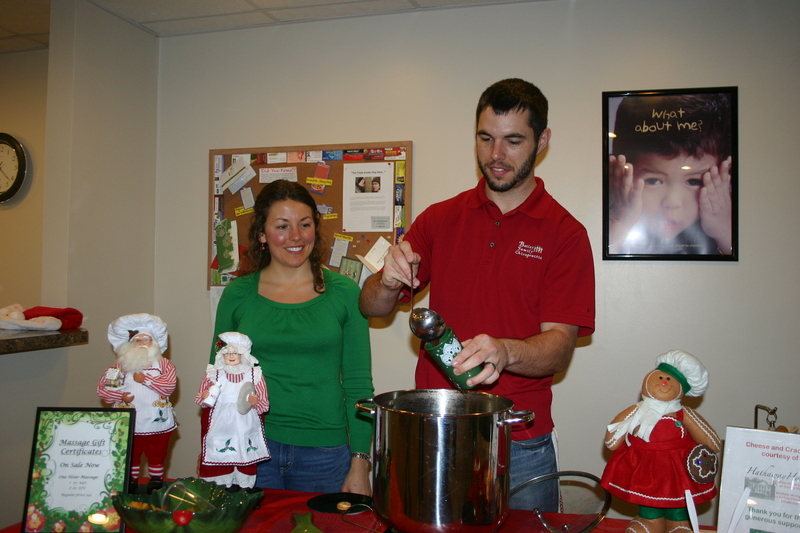 Ashley and Dan Bailey serve a sample of their wassail brew.